Here’s an article and we share the feelings. No. There is no organic source of fertiliser in Hawaii. All fertiliser organic or otherwise, needs to be shipped in. This of course increases prices dramatically and we could not afford to apply the adequate amounts of organic nutrition to our coffee trees that they need to remain vigorous, without pricing our coffee to the extreme and frankly, we could not make a living at all. Bob does weed whack the whole 5 acres and we try to be as organic as possible although again, we do use inorganic fertiliser. We want our plants to be totally healthy and fully nurtured and we want to remain in farming so we have made an educated decision to judiciously use the inorganic fertiliser we use. Our plants are HAPPY! We are careful and sustainable farmers. Our land was farmed by Hawaiians, pre-contact, and we respect the farming that occurred before us and respect the right to farm healthily after us. Total Satisfaction is our AIM! When we guarantee satisfaction, we guarantee it when you receive it and we can not still be responsible for it 3 months later. 01/24/2015: In response to a customer who wrote yesterday. His roasted bag was sent October 22, 2014. He wrote yesterday (01/24/2015) saying the coffee tasted “really acidic”. Hmm… too many unknowns to replenish that 5 pound bag at our expense after 3(!) months. How did it taste for the first month(s)? okay-nuff said. 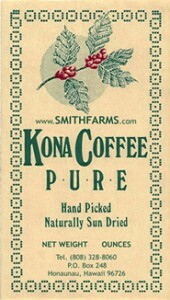 The 100% Kona green coffee you get from us is certainly Fairly Traded but the FT people do not come to Kona so we do not get that marque. The FT people assume that the US, (and Hawaii is one of the 50 US States) already does things fairly– as in paying the workers a good wage, which is true. We have a dedicated US Federal Department of Agriculture too with its own set of rules. We are also proud to be a Sustainable farm, ensuring this land can be farmed for many generations after us. We use no pesticides nor insecticides on our farm either. I believe the FT people are not as focused on that aspect. I also think one of the most important things about us at Smithfarms is that Bob has a college (B.S.) degree in Tropical Agriculture and that makes a lot of difference because he knows theories as well as practical solutions. Our farm is happy and healthy which is not automatic with Fair Trade farms. I just want to assure you that we are very prudent farmers, even among Kona Coffee farmers and certainly amongst the world’s coffee farmers. We believe our coffee is raised as carefully as it can be. We are proud of our end product and spend a lot of dedicated time on the details to get it there.